The Categorical Training Track is the traditional track at UVA and emphasizes training in general internal medicine with a focus on subspecialty and hospital-based practice as well as significant exposure to ambulatory elective opportunities. In addition to providing a core base of rotations on general internal medicine clinics and wards, the program provides numerous consultative specialty rotations which expose the resident to both inpatient and outpatient problems for which referral is needed. Rotations through an inpatient Hematology-Oncology Service and Acute Cardiology Service in addition to the General Medicine Services, one of which clusters the GI cases for a more intensive training experience in this subspecialty. This allows for inpatient exposure to both general internal medicine and the major subspecialties taught by subspecialists. Rotations through the Medical Intensive Care Unit and Coronary Care Unit with curriculum stressing the fundamentals of hemodynamics, mechanical ventilation and ample opportunity for bedside procedures. 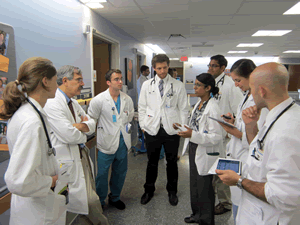 During their time in the MICU, residents will be leaders of the code team for the entire hospital. Many opportunities for the intern and resident to perform procedures including central venous lines, arterial lines, thoracentesis, paracentesis, lumbar puncture, arthrocentesis, as well as ventilator management. The ability to tailor elective time to maximize exposure to a wide range of internationally recognized faculty in clinical and research venues. Graduates of the residency program consistently match at their top choices in fellowships at highly competitive programs throughout the country. This track prepares residents equally for a career in general internal medicine or for further subspecialty training, and is ideal preparation for a hospitalist career. Applicants with strong interest in general internal medicine or possibly subspecialties that are heavily ambulatory in nature should also consider the Primary Care Track. For further information about the Categorical Track, please contact the program at imresidency@virginia.edu.